The Mediatrix unit must be reinitialized to its factory default settings to make sure the configuration can be successfully executed. The SipProxy service requires a licence. If you perform this configuration note after customising the Mediatrix unit, for example after configuring a custom SIP gateway, all customised parameters will be lost. If you need to perform more that than the configuration described in this configuration notes, start by this one, then move to the other required configuration. IP address at which the Web interface of your Mediatrix unit can be reached. The Short_Dialing transformation rule allows using short extension numbers when in survivability mode, instead of dialing the full destination number. For example, to transform extensions 1100-1199 into 18885551100-99, it is possible to set the Criteria to (11..) and the Pattern to 1888555\1. However, if it is left to the default values, the rule has no effect since it tries to match a phone number that contains "XXXX". When the Hosted SIP service fails, internal calls go through the SipProxy. When the Hosted SIP service fails, PSTN calls go through the SipProxy, and are internally routed to the telephony interfaces. In survivability situations, when the Hosted SIP services comes back online, the Mediatrix unit must wait for a REGISTER to go through before sending the calls to the SIP trunk. The Mediatrix unit is located in the LAN, behind a Near-End NAT. You must have a licence key and you must know the MAC Address of your unit Locating the MAC Address of Your Mediatrix Unit . Using notepad, or equivalent, open the individual script file that has the same MAC address as the device. Go to System /Information . In the Activate License table, enter your licence key in the field found in step 2 . Go to Network /Host . In the Automatic Configuration Interface table, select Uplink from the selection list located on the same line as Automatic IPv4 config source network . The unit will use the Uplink interface for all SIP Signaling. In the Default Gateway Configuration table, from the IPv4 /Configuration Source selection list, select Static . In the IPv4 /Default Gateway field, enter the IP address used as the Static Default Router for the Uplink Network Interface. In the Default Gateway Configuration table, from the IPv6 /Configuration Source selection list, select Static . In the IPv6 /Default Gateway field, enter the IP address used as the Static Default Router for the Uplink Network Interface. The specified address is used as the current default router address. In the DNS Configuration table, form the Configuration Source selection list, select Static . For each DNS used, enter the IP address of the DNS. Make sure there is an SNTP server available. In the SNTP Configuration table, from the Configuration Source selection list, select Static . Provide an IP address or domain name and port numbers for each SNTP server you are using. The best practice is to use the servers supplied by your Internet Service Provider, then complement with servers from a different network close to your geographical area. For example: time.nist.gov (USA), ntp4.sptime.se (Sweden), time1.isu.net.sa (Saudi Arabia), ntp.nict.jp (Japan), time.google.com (Worldwide), pool.ntp.org or one of their regional server pools (see https://www.ntppool.org/ for more information). If necessary, change the value of the Synchronisation Period . If necessary, change the value of the Synchronisation Period on Error . In the Network Interface Configuration table, from the Link selection list located next to Uplink , leave the default value, i.e. ETH1. If port-forwarding is enabled on the network NAT/Router, the Uplink Network Interface must be set with a static IP address. In the Static IP Address field enter the assigned static IP address. The unit can be reached (via the Web) through the Uplink static IP address . In some instances, the configuration of the default servers may already be completed. Go to SIP /Servers . In the Registrar Host field, indicate the server IP address or FQDN to use for this gateway. In the Proxy Host field, indicate the server IP address or FQDN to use for this gateway. In the Messaging Server Host field, indicate the server IP address or FQDN to use for this gateway, if needed. Leave the Outbound Proxy Host field empty, unless specifically instructed to set a value. Setting the address to 0.0.0.0:0 or leaving the field empty disables the outbound proxy host. Located at the top of the page, click restart required services . Go to SIP /Registrations . For each endpoint requiring authentication, repeat steps 3 and 4 . From the Register selection list, select Enable . From the Gateway Name selection list, select Default . Click Apply and Refresh . Go to SIP /Authentication . Click Edit All Entries . In the Authentication table, enter the credentials for each port. Click Apply and Refresh Registration . Validate if endpoints are registered. (SIP /Registrations ). This task is mandatory if the registration username is a string, not only numbers. Go to Call Router /Auto-Routing . From the Auto-Routing selection list, select Enable . From the Criteria Type selection list, select SIP Username . Set the SIP server, username and password according to the Cloud Based SIP Service configuration. At this step, these SIP clients do not use the Mediatrix unit to communicate with the Sip Server. Validate that the SIP clients are correctly registered. Make calls between all SIP clients in the LAN. The calls should be routed between the SIP clients, and all available services should work. At this point, the first part of the configuration of this use case is completed. Go to Management /Configuration Scripts . In the Execute Scripts table, from the Suggestion selection list, choose Survivability.cfg. From the Transfer Protocol selection list, make sure that File is selected. Click Apply and Execute Now . The script may take some time to execute. A message to restart the service may be displayed, but it can be ignored. Wait about 30 seconds for the script to be completely executed, then refresh the page.(F5). In the Scripts Status Execute table make sure Current State is displaying Idle and Last Result Success . The survivability configuration script will be executed from the unit file management system, and the values specified in the script will be applied to the running configuration. The survivability proxy is now activated on the unit. Go to SIP Proxy /Configuration . In the Monitoring section of the Configuration table, in the Interval field, enter the interval at which monitoring requests are sent to verify the SIP server status, in seconds. In the Toggle Delay field, enter the delay before reporting a status change of the monitored destination, in seconds. In the Destination field, enter the server IP address or FQDN to monitor. In most cases, this will be the Registrar Host. In the Keep Alive Error Code field, list the response codes (comma-seperated) that indicate that the server is down. To detect that the server is down, use the error codes the server will return when it is not available. This will be much faster than using the timeout. Go to SIP Proxy /Routing . In the User Transformations table, at the right of the Short_Dialing row, click . 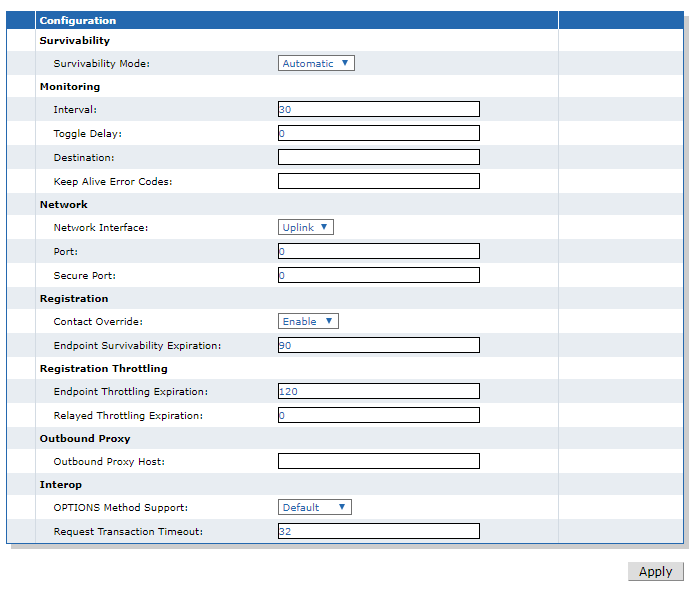 In the Configure User Transformation table, modify the Criteria and Pattern fields as required. The Short_Dialing transformation rule allows using short extension numbers when in survivability mode, instead of dialing the full destination number. If it is left to the default values, the rule has no effect since it tries to match a phone number that contains "XXXX"
These steps must be performed on each LAN SIP clients. Set the Outbound SIP Proxy server to the Mediatrix unit IP address. The Mediatrix unit will now route the calls between SIP clients, and all available services should work. Under SIP Proxy /Registration Cache , in the Registration Cache Search Results table, and each registered user should be displayed in the AoR field. In the Execute Scripts table, from the Suggestion selection list, choose Survivable_Trunks.cfg. Wait about 30 seconds for the script to be completely executed, then refresh the page. (Ctrl F5). Transfer succeeded but failed to execute completely for all other type of units. The survivable trunks configuration script will be executed from the unit's file management system, and the values specified in the script will be applied to the running configuration. This task is not mandatory. The Survivable Trunks script executed in the previous step sets all FXO ports to automatically call the same destination, this procedure explains how to customize the destination on one or multiple ports, for inbound PSTN calls. The default is to use a special number "88888", which will be redirected in a later step to a Target Extension (for example the main reception). Go to Telephony /Services . From the Select Endpoint drop-down menu, select a specific FXO endpoint. To change the default configuration of the Endpoint Specific , select Yes . Often, in order to configure a blank field, you must first enable the previous field. In the Automatic Call section, complete the fields as required. In the Target_Extension row, at the User Transformations table, click . In the Configure User Transformation table, modify the Pattern field as required. The Target_Extension transformation rule allows forwarding any PSTN inbound call to a specific internal extension, usually the main reception. By default all incoming calls are tagged to the special number "88888", the transformation replaces that number by the target extension number, in order to forward those calls properly. This task is not mandatory. Any dialed destination, other than an internal registered number, will be sent to the PSTN route when in survivability mode. In the Routes table, click located on the last route. In the Configure Route table, modify the Criteria field. there is no selection criteria by default, if a specific PSTN prefix is required then a valid regular expression has to be set, examples: 9[2-9].….….$ , or 00.$ if the Remove_PSTN_Prefix transformation had to be modified to use the 00 prefix to access the PSTN. In the Target User Transformations field, select the transformation you want to associate. In the Remove_PSTN_Prefix row, at the User Transformations table, click . In the Configure User Transformation table, modify the fields as required. By default the Remove_PSTN_Prefix transformation rule removes the first digit from the destination number, when prefixed by 9 only. An alternate configuration, popular in Europe (strip the leading two digits 00) would be to set the Criteria to "00(.+)". Go to Management /Backup and Restore . In the File Name field, indicate the name of your backup. The file name is case sensitive. As a best practice, add the *.xml extension. Make sure to indicate the firmware version the backup was made from because a backup file can not be restored on an older firmware version than the one it was taken from. Remember, if you have several units with several configurations and plan to reuse the configuration on another unit, the name must be explicit. Indicate the date of your backup, the interfaces used, the device model, etc. From the Transfer Protocol selection list, select File . From the Content selection list, choose the elements you wish to include to the backup. If you wish to use encryption for backup operations, complete the Privacy Parameters . Media5 corp strongly recommends to use a privacy algorithm (encryption) to protect certificates and passwords. Click Apply and Backup Now . The configuration will be saved in the unit file management system. The backup file will appear at the end of the list of the File page, under Management /File . For more details, refer to the Mediatrix Documentation .